I know I say it every four weeks, but can you believe how close it's getting to being able to actually meet this amazing little girl that's been kicking up a storm in my belly? The past four weeks have been relatively uneventful. And considering how I rounded out week 20, I am definitely grateful for that. The quick trip to the hospital and several subsequent blood tests produced no result as to why I was having the debilitating pain in my lower abdomen. Their best guess still lies with either a kidney stone or a bowel obstruction. ::shrug:: It's been weeks since I had the pain, so I am counting my blessings doubly hard. Never mind I've been having more increased nausea again the past week. Par for the course, I suppose. The bigget milestone is that I've officially hit the 20 pound weight gain mark. I guess it's a good thing it took me this long to get there, right? My goal was to stay under 40 pounds total while packing it on, so we'll see how close I come to reaching that goal. Being at home all day long, surprisngly, leaves me getting less exercise than if I was working. Perhaps I should have taken more advantage of those 65 degree January afternoons to go for a brisk stroll in the park. However, Puff still insists I don't look pregnant from behind. Somehow, I think, that's supposed to be a compliment. It's hard to believe I've been out of work since I took my week 16 picture. In some sense, I'm trying to see that as a blessing. Less stress and worrying is always a good thing when baking a baby, right? Plus, I've been able to stay off my feet a lot which has kept down a lot of pregnancy swelling I hear should be happening right around now. I also don't snack as badly as I did at the office... I haven't had a piece of chocolate candy in ages! And it has given me and Puff weekends to spend trolling antique shops looking for the perfect old dresser or mid-century Danish modern buffet or record cabinet to repurpose into a dresser/changing table. We've struck out so far, but that doesn't mean we'll stop looking! 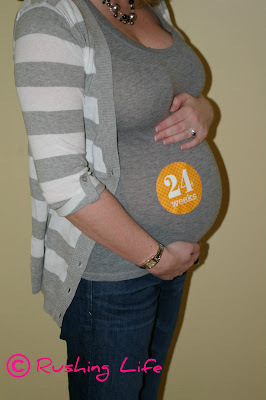 Oh... and I finally felt the pressure to start the baby registry! Bring on the goodies! But the best part was the night that Puff told me he is really excited that we're having a little girl. After some thought (I know he was initially unsure) he said that it's probably better that way. Because if we had had a son, he would've been disappointed had he been into sports instead of cars. Now, if Bimmer isn't into that, he can just blame it on her being a chick. And if she does happen to be into cars like her daddy? Just an added bonus!